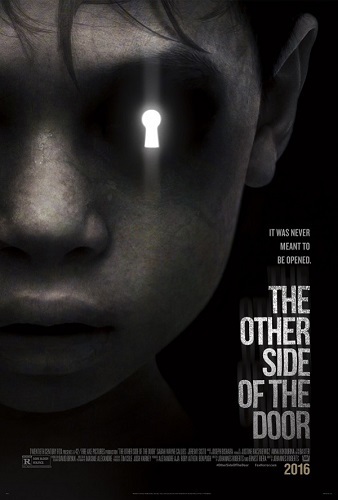 Tag line: "What is on the other side..."
Drawing inspiration from the classic short story The Monkey’s Paw as well as Stephen King’s Pet Sematary, 2016’s The Other Side of the Door may not be the most original supernatural-themed horror movie ever made, but it is a tense, occasionally frightening film about a grieving mother whose life is thrown into chaos when the one thing she wants most in this world is given to her. The setting is Mumbai, India, where Michael (Jeremy Sisto), an antiques dealer, lives with his wife Maria (Sarah Wayne Callies) and their daughter Lucy (Sofia Rosinsky). Unfortunately, this young family has seen its share of tragedy; ever since the death of their son Oliver (Logan Creran), who was killed when their car careened off a bridge into the water below, Maria has been in a deep depression. Michael (Jeremy Sisto) tries to reassure his wife that everything will be OK, but nothing seems to snap her out of her funk. Then, one day, the family’s live-in maid Piki (Suchitra Pillai) tells Maria about an ancient temple situated on the outskirts of a small village, a place that Hindus believe acts as a gateway between the living and the dead. Legend has it that if you spread the ashes of the deceased on the temple’s steps and then lock yourself inside, the person’s ghost will visit you at some point that same evening. The only stipulation is, no matter how much the spirit begs and pleads, you cannot open the door; doing so would upset the balance between the real world and the realm of the dead. Desperate to say her last goodbyes to Oliver, Maria travels to the temple and follows Piki’s instructions to the letter. Sure enough, Oliver’s spirit eventually shows up, and it’s soon after that Maria makes a mistake which will haunt her and her family (literally) in the weeks to come. Part of what makes The Other Side of the Door a powerful experience is that it’s a ghost story wrapped in a family tragedy, and there are moments when it will break your heart (we see a flashback of the accident that claimed Oliver’s life, and it is a deeply dramatic scene, as is the conversation that occurs between mother and son at the temple door). Using this as a starting point, director Johannes Roberts weaves a story of love and terror, one steeped in religion and mythology, during which a beloved child becomes something quite sinister (hence the film’s connection to Pet Sematary). All of the performances are good, but the two standouts are Sarah Wayne Callies as Maria, the grief-stricken mother (a scene set inside a hospital, where Maria talks with Michael after her failed suicide attempt, will reduce you to tears); and, even more impressive, Sofia Rosinsky (in her screen debut) as Lucy, the adolescent daughter drawn into a situation she cannot possibly understand (the young actress is especially strong in the last 1/3 of the film, when her character undergoes a transformation of sorts). More than anything, though, The Other Side of the Door benefits from the filmmakers decision to shoot on-location in India (the temple sequence was shot at an actual religious spot, one that the faithful believe is a doorway into the spirit world), which brings an air of mysticism to the proceedings that intensifies as the film unfolds. With this setting, coupled with its tale of sorrow and loss, The Other Side of the Door takes what might otherwise have been a run-of-the-mill ghost story and turns it into something special.